Forecastle, are you ready? Weekend passes go on sale Wednesday, February 13th at 10AM EST. Follow these tips to ensure smooth sailing through your purchase process. WHEN: Weekend passes go on sale Wednesday, February 13th at 10AM EST. WHERE: Tickets will be on sale through forecastlefest.com/tickets which will then take you to forecastlefest.frontgatetickets.com to complete your purchase. 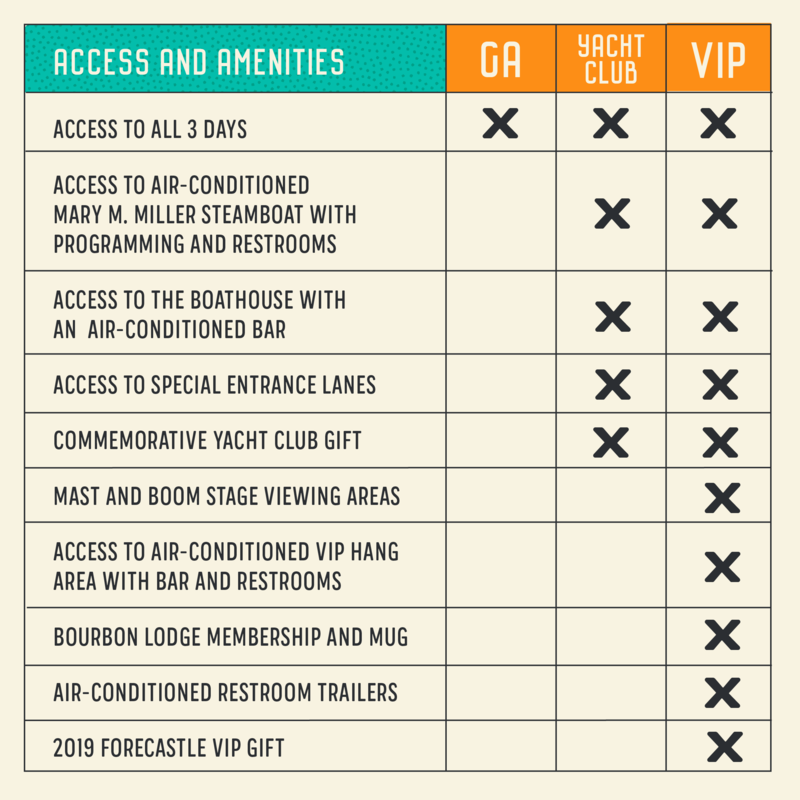 WHAT: Choose from General Admission, Yacht Club, and VIP. Take a look at the graph below to compare our ticket options. 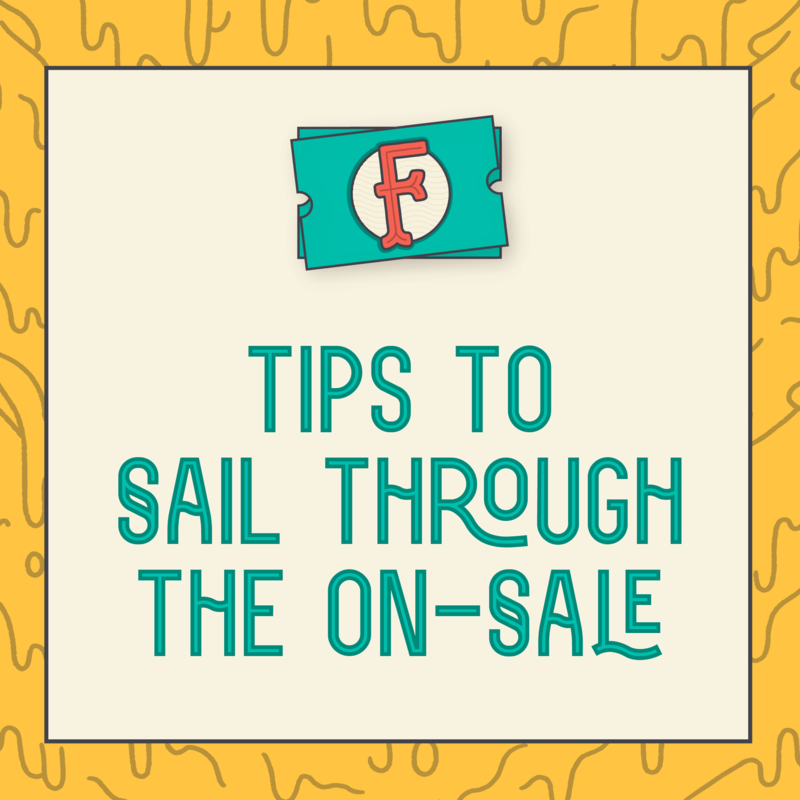 TICKET LEVELS: Ticket levels are our way of rewarding fans who purchase their Forecastle tickets early. All tiers of the same ticket type are the same exact ticket, just at a different price. Each price level is available in limited quantities. Once a price level is sold out, tickets will continue to be sold at the next price level, while supplies last. It’s important to set those alarms and purchase early when tickets go on sale. CREATE AN ACCOUNT: To purchase a pass, you’ll have to create a Front Gate Tickets account. This is the account you’ll log into to review your order, change your shipping address, etc. To save some time and to get ahead of the game, create your account now at forecastlefest.frontgatetickets.com. Click “Sign In” at the top of the page and then “Sign Up”. PURCHASE PROCESS + ADD ONS: Once you’ve added your tickets to your cart, you’ll have 10 minutes to to check out. Before completing your purchase, you’ll have the option to add a Bourbon Lodge membership. Check out those details now so you know what to add on sale day! LAYAWAY PLAN: Spread out your payments on GA, Yacht Club and VIP ticket purchases using our layaway plans. Use this for a single GA Weekend ticket and pay as low as $39 down at check out. You’ll choose this option when checking out under “Select Payment Method”. WHERE CAN I SHARE MY PRAISE? In addition to sharing your experience on social media, be sure to take the customer survey on your order confirmation page. We would love to hear your feedback so we may improve the process in the future.